Decker family care nurse practitioner students taking part in a program aimed at retaining advanced practice nurses in rural communities. The program is funded through a HRSA grant. Back row, from left are JoLynn LaBouf, Kevin Jones, Beth Plumadore, Philip Nedlik, Mallory Eberly, Alexis Rogers, Emily Hodack, Meaghan Provost, Brittany Wilson and Dan Babcock; front row, from left are Nicole Fletcher, Katie DeWitt and Karleena Mickle. Image Credit: Jonathan Cohen. Decker family care nurse practitioner students taking part in a program aimed at retaining advanced practice nurses in rural communities. The program is funded through a HRSA grant. Back row, from left are JoLynn LaBouf, Kevin Jones, Beth Plumadore, Philip Nedlik, Mallory Eberly, Alexis Rogers, Emily Hodack, Meaghan Provost, Brittany Wilson and Dan Babcock; front row, from left are Nicole Fletcher, Katie DeWitt and Karleena Mickle. Photography: Jonathan Cohen. Many rural inhabitants, including the elderly and disabled, would rather avoid a visit to the doctor’s office than face an hour (or more) drive to get there. That drive time can increase drastically for specialist care. This is a predicament across America. And in rural areas like upstate New York, where there is a serious deficiency in medical healthcare providers per capita, the problem is only growing. 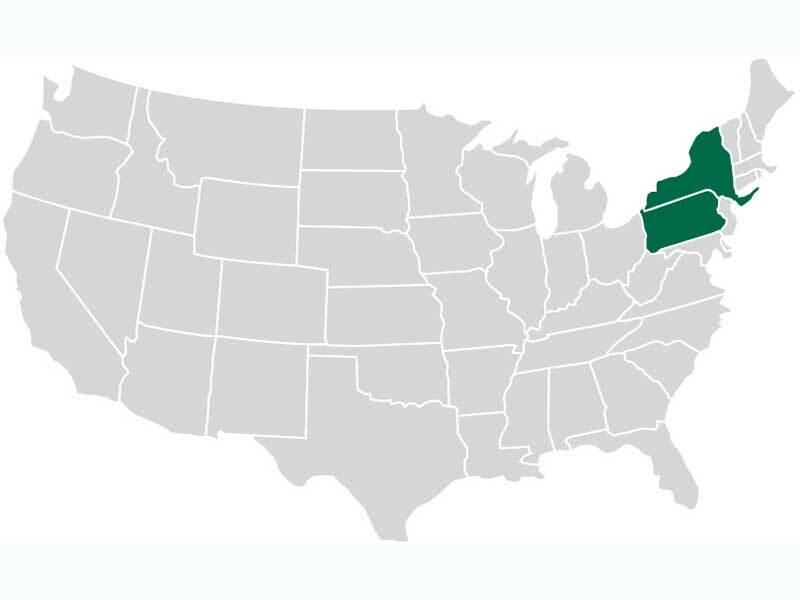 To help combat it, Binghamton University’s Decker School of Nursing faculty members Nicole Rouhana, MS ’95, PhD ’11, and Pamela Stewart Fahs, MS ’85, co-wrote a grant application to the Health Resources and Services Administration’s ANEW program. When the grant was accepted, Decker received $1.2 million. We have great need for more rural nurse practitioners. The problem has existed for a while, but now it’s growing. 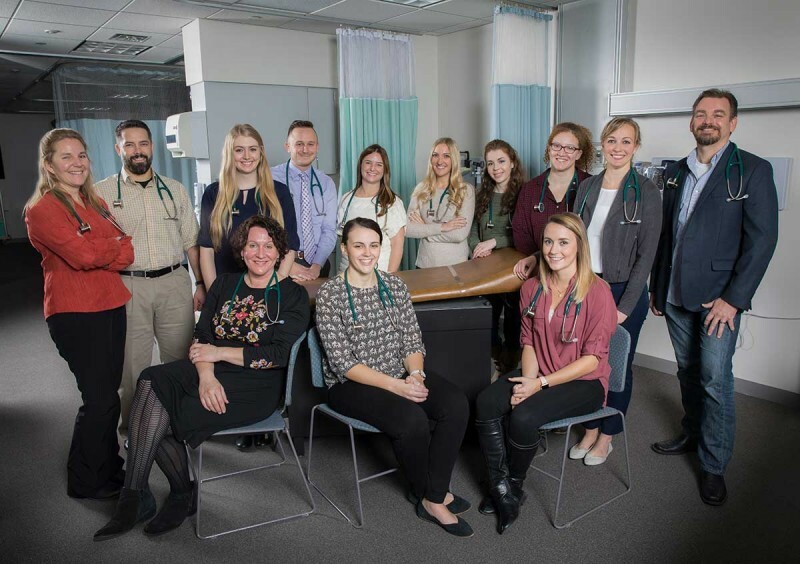 The Advanced Nursing Education Workforce (ANEW) program helps support nursing students by funding them to practice clinical training in rural settings. The grant allows Decker to place nursing students in rural areas of central and southern New York, as well as northern Pennsylvania. Rouhana, the program’s project director, manages the funding stream, evaluates and determines outcomes of the grant and ensures students have the clinical resources they need to succeed. Together with Frances Munroe ’81, MS ’90, she visits students on-site and checks in with preceptors — on-site instructors — to examine student progress. Rouhana says the number of healthcare providers moving from rural areas to urban centers is a huge issue in Binghamton’s surrounding regions. Munroe, the program’s clinical faculty liaison and a clinical assistant professor of nursing, agrees with Rouhana. She trains graduate nurse practitioner students, including those in the ANEW program, and communicates frequently with the scholars and their preceptors. With New York’s aging population, she says the program is addressing an increasing need in rural communities. The Decker School's HRSA ANEW Scholars program is looking to students from rural backgrounds to help fill a growing need for rural healthcare providers. Image Credit: Katie Honas '14. This acknowledgement led Rouhana and Fahs, the program’s rural consultant, to consider “homegrown” nurse practitioners as a possible solution. The ANEW program sends Decker students who are originally from rural areas to practice in places where they can learn and adapt their knowledge to better provide healthcare to rural communities, which Fahs says can be challenging. Fahs is also Decker’s Chair in Rural Nursing and editor-in-chief of the Online Journal of Rural Nursing and Health Care. She hopes sending rural students to practice in rural areas will help convince them to stay there after they graduate. This seems to have worked with ANEW scholar Daniel Babcock, who is clinically placed in Norwich, N.Y.
“After graduation, I plan to practice rural primary care in Chenango County or Delaware County, serving the communities I grew up in,” Babcock says. The ANEW program’s next initiative is to integrate telehealth technologies into some of the practices. Ann Fronczek, MS ’99, the program’s telehealth and nursing education consultant, says rural areas need telehealth due to a lack of specialized healthcare providers and because of difficulties caused when patients are forced to travel long distances for health issues. “We’re trying to enable some of the more remote sites with technology they’ll actually be able to use for practice or to support education of nurse-practitioner students,” says Fronczek, an assistant professor of nursing. Rural communities like my hometown [Susquehanna, Pa.] are underserved and need quality health-care providers to serve their populations. Every day that I work, I see firsthand that there is an enormous need for healthcare providers in rural Pennsylvania, and I am looking forward to helping fill that gap. Telehealth is a broad genre that involves using telecommunications technologies to provide healthcare and can allow practitioners to conduct “visits” in which patients remain in the comfort of their own homes. For example, patients can use an electronic stethoscope (at the direction of the practitioner) among other medical tools. They can also communicate with a specialist located in another city from their local practitioner’s office, using immediate, real-time interaction technology. Fronczek says patients trying telehealth for the first time are skeptical, but are amazed at how much they can do, even though some argue that telehealthcare reduces the connection between nurse practitioners and their patients. Telehealth capabilities counteract the need for patients to make long trips to healthcare facilities and allow practitioners to more effectively communicate with specialists, using Skype-like functions to get opinions instantly. The grant has been so successful that the program has been given a third year of funding. The program’s next steps include a podium presentation at the Rural Nursing Organization’s International Rural Nursing Conference and the implementation of telehealth technology to rural sites in the program.